In spring 2017, after 12 years of using the original “Hazard Hamlet” electrical safety display, Director of Marketing Terry Mazzone and Assistant Director Brian Barr of the Lorain-Medina Rural Electric Cooperative upgraded their unit to the new generation Hazard Hamlet safety model. According to Mr. Mazzone, the Hazard Hamlet is “a very effective tool for electrical safety presentations […], keeping the audience captivated until the end”. Additional new features, such as focused lighting on individual rooms, bright LED figurine lighting and arcing and digital sound effects are being rolled out this fall on this latest version of the Hazard Hamlet / House module (HOL). The Modeltech R&D Department is also working on other safety displays to integrate those interactive features and more to the ‘Gas Hazard House’ and the Smart House Energy Conservation unit, just in time for the end of the year. If you’re planning for a Christmas gift, give us a call! The August 2017 edition of Ohio Cooperative Living further reports on how the organization uses this highly effective electrical safety display to teach good habits to local children. 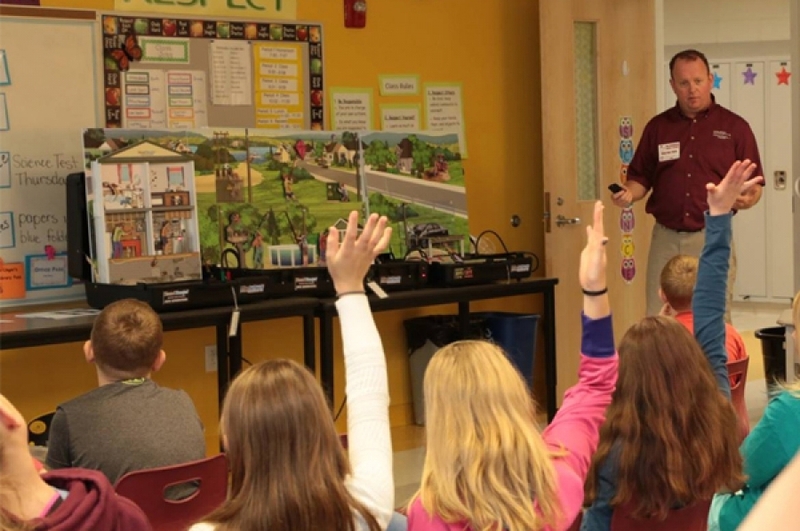 The publication reports that the small-scale electrical safety model is being used as a teaching tool at the cooperative’s office as part of a facility tour, as well as local schools, 4-H group meetings and libraries, as well as the Lorain County Fair. Out of the numerous accidents scenarios of the safety display, the “loud zap of electricity” is specifically mentioned as grabbing children’s attention! In Wellington, Energy Services Advisor Don Foster hosted a demonstration at the Summer Reading Club of the Herrick Memorial Library. A Hazard Hamlet safety display was used to teach children about electrical safety, explaining how everyday situations can be dangerous, and to stop, look and think whenever electricity is involved. Mr. Foster also shared tips on how to be more energy-efficient at home.